Amrit Kirtan Pothi is used by Raagis to perform Kirtan and can be used by any Sikh devotee/ enthusiast to learn & understand Gurbani and its elaboration in the compositions of Bhai Gurdas ji and Bhai Nand Lal ji. 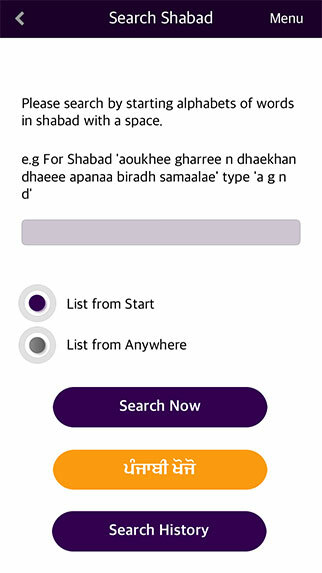 The application allows you to search any shabad by just entering initials of the shabad with space and allows inputs using English translation and transliteration.
" Har keertan sune, Har keertan gaave. Tis jan dookh, nikat na aave." 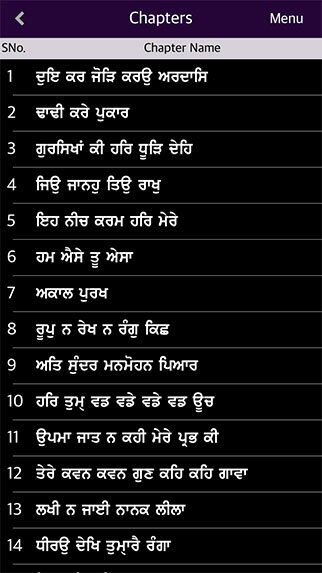 The Amrit Kirtan App have chapters similar to Amrit Kirtan pothi to make it easy for you while using this digital pothi. Apart from that to make it more useful, we have now included complete Sri Guru Granth Sahib, Sri Dasam Granth Sahib, Varran Bhai Gurdas ji, Kabit Bhai Gurdas ji and Kabit Bhai Nand Lal ji, giving you much bigger choice of Shabads to sing from. Further updates are in progress. Searching the desired Shabads is very easy. 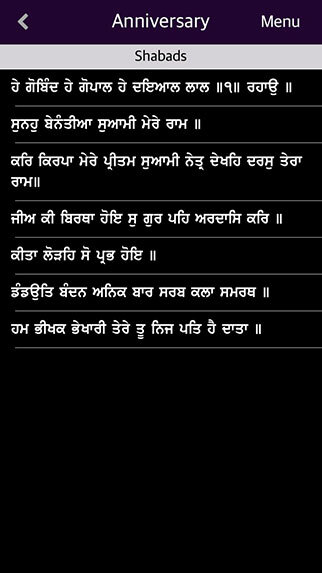 Just tap on the Search By Shabad or page number icon and find the shabad you want. You can also search the shabad using first ‘character’ of each word in a tuk(line) of the shabad you want to search by searching minimum of 4 characters. There is an option whether to search from beginning of the shabad of anywhere in the shabad. The Shabads searched by you can be saved as favorites under various categories that can be created by the user making it easy to revisit them without searching them again. Just tap the star icon on the top right of the application. This is very helpful for Raggis who perform a particular set of Shabads while doing a Kirtan. To move from one shabad to next or previous shabad just slide your finger in the desired direction. 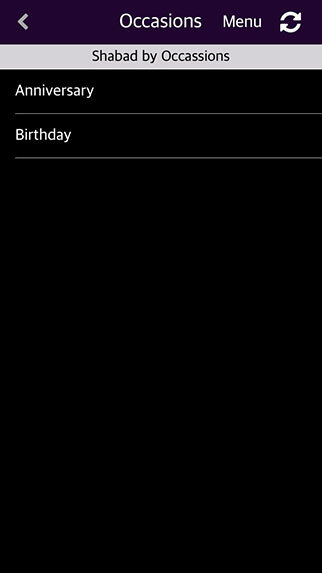 You can share a shabad for prinitnig using the Share Icon on the top right of the application screen. 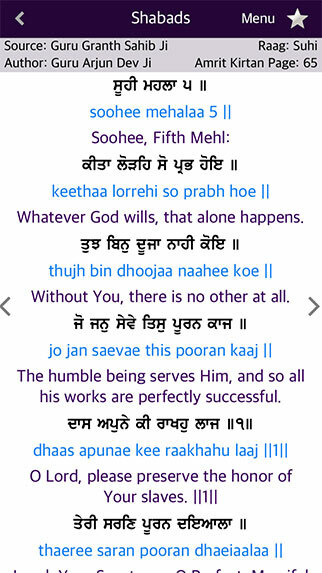 You can email it to a friend for printing the shabad or directly to the printer(the one which support email printing). More sharing options are in development and will be available soon. 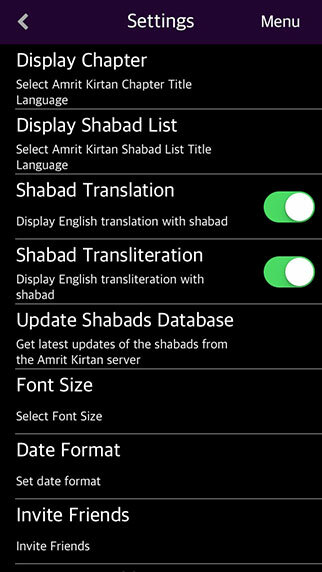 Search, save, print and share any Shabads using the Amrit Kirtan App by using a phrase or page number. For a tour browse the screenshots of the App below. "I thank you for this great app for iPhone have been waiting for it for long. I go to Kirtan satsang and use it all the times. 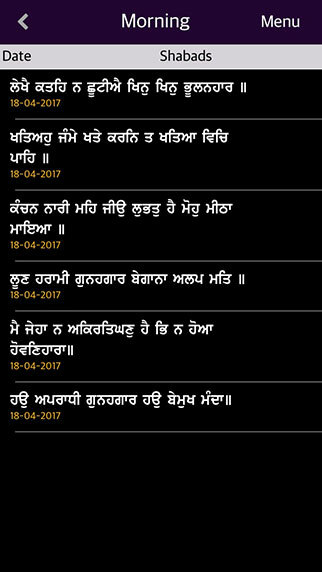 I appreciate keeping it free and making it advertisement free as they are big distraction in lot of gurbani related apps. Great app.. Keep up the great SEWA." 2014-17 © Momentum Infotech, Inc. All rights reserved.